Those two wacky movie makers and corn kings, Ian Chaney and Curt Ellis, have been hitting the promotional circuit over the past months spreading the "evils" of American farmers and "demon corn" in their movie, "King Corn". But not everyone thinks the movie is PBS's new "Masterpiece Theater" contender. We found an article this week that tells a bit more of the family drama behind the film. The article was written by Marcia Gorrell who once hosted the two movie moguls for a night at her family farm. But Marcia's more than just a good family farm host. She knows one of the Yale-graduate film makers, Curt, because his older sister married her younger brother. So of course, imagine our surprise -- and hurt -- when we watched the film, which we felt was very negative to family farmers such as ourselves. I think my oldest son, still shell-shocked after watching, summed it up best. "It's well done but ... it's so wrong." Like many others, she and her family were shocked and hurt to see a film with so many inaccuracies being passed off as factual. 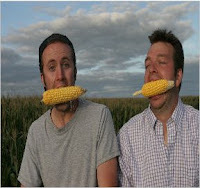 So when (in the movie) Curt and Ian take a bite of field corn, (not sweet corn) well past "roasting ear" stage and into the dent stage, throw it back into the field and call it "crap, " it hurts -- a lot. Talk about awkward. She and her family have shared their thoughts with Ian and Curt. But the two press on, spewing their message that we're all fat, stupid corn zombies. After watching, if you are a farmer, please let someone know what you think is wrong in the film -- someone who may not be as familiar with farming as you are. And if you aren't a farmer, please don't let "King Corn" be the last word on agriculture in America and Saline County. It is much more than a 90-minute film. Talk to a farmer, take a tour and ask questions. Supporters of American agriculture need to speak out against propaganda films like "King Corn". Reducing America's production of food, feed, fiber and fuel for the world hurts everyone. It might be a bit awkward at the next family Thanksgiving for Curt when he meets up with his farming family. But at least there's cornbread and corn-fed turkey!